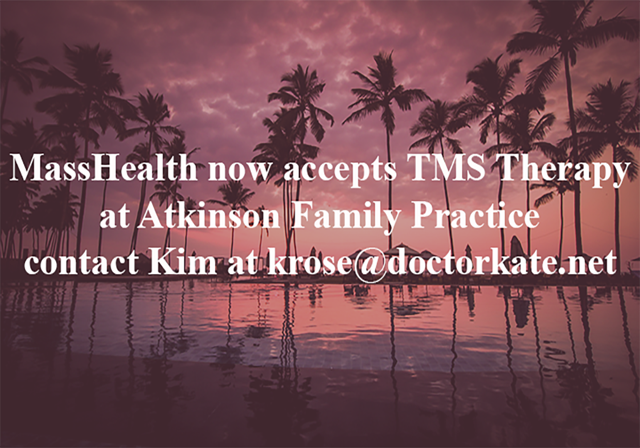 Welcome to TMS Treatment at Atkinson Family Practice. We provide patients in Amherst, MA and surrounding area the latest in depression treatments. We are pleased to be able to offer Neurostar® TMS Therapy to our patients. Transcranial Magnetic Stimulation Therapy is one of the most technologically advanced depression treatments available. This non-invasive, outpatient therapy is FDA cleared and has helped thousands of depression patients who have not received adequate results from antidepressants. TMS (Transcranial Magnetic Stimulation) is the first and only FDA Approved treatment for depression that does not require surgery or medication, and is safe and effective. TMS has had extensive research to back it up at several major medical research universities, and the only side effect is slight scalp discomfort during the actual procedure. Already have a TMS appointment set up? Or want to find out if you qualify for treatment? Click here to fill out all relevant forms! Have you sought treatment for your depression only to find unsatisfactory results? NeuroStar TMS Therapy has been clinically proven to improve symptoms of depression. Transcranial Magnetic Stimulation, TMS Therapy, uses short pulses of magnetic fields to stimulate nerve cells in one of the areas of the brain thought to control mood. TMS Therapy is performed in a psychiatrist’s office under his or her supervision while you remain awake and alert. Atkinson Family Practice (AFP) began Transcranial Magnetic Stimulation (TMS) in March 2016 under the direction of Dr. Nora Schwartz-Martin, MD. 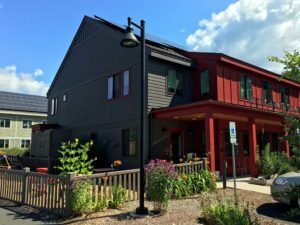 TMS is a natural addition to the integrative practices happening at AFP, and a much needed service to the western Massachusetts area. Dr. Schwartz-Martin strongly values the benefits of integrative medicine, and is thrilled to see TMS helping so many patients. Dr. Schwartz-Martin was trained in psychiatry at New England Medical Center, Cambridge Health Alliance, and Harvard University Student Services. She has also received extensive training in psychopharmacology and emergency psychiatry. She and her husband are the proud parents of two boys, and their many talents continue to amaze them every day. MassHealth now covers TMS Treatments at Atkinson Family Practice. Depression is a serious medical illness affecting more than 16 million American adults every year, 6.7% of all U.S. adults1. Often a debilitating disorder, depression results in a persistent state of sadness or loss of interest or pleasure which interferes with an individual’s thoughts, behavior, mood, and physical health. While the exact cause of depression is not known, the leading scientific theory is that depression is caused by decreased activity in the neural networks of the brain that regulate emotion and motivation. Increasing levels of neurotransmitters in the brain has been found to reactivate these neural networks, or create new networks. Neurotransmitters are chemical messengers that send signals between brain cells. Depression is most often treated with antidepressant medications. It is believed that antidepressant medications work by increasing the levels of these neurotransmitters. The exact cause of depression is not known, but leading research in Neuroscience points to an imbalance in the brain’s neurotransmitters as the manifestation of depression. Neurotransmitters are chemical messengers that send signals between brain cells. A person’s genetic make-up and life history may also determine a person’s tendency to become depressed. Are some people more likely to become depression than others? NeuroStar® is non-systemic (does not circulate in the blood throughout the body), so it does not have side effects such as weight gain, sexual dysfunction, nausea, dry mouth, sedation, etc. The most common side effects reported during clinical trials were headache and scalp discomfort – generally mild to moderate – occurring less frequently after the first week of treatment. A typical course of TMS Therapy is 5 times per week for 19-37 minutes sessions, depending on what the doctor determines is the correct protocol, over 4-6 weeks. 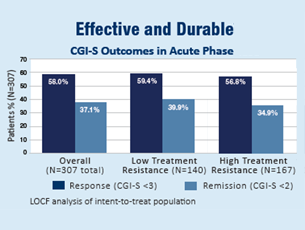 Any additional treatments are based on clinical judgment. Not always, the most common side effect related to treatment was scalp discomfort during treatment sessions. This side effect was generally mild to moderate, and occurred less frequently after the first week of treatment. NeuroStar TMS is the only TMS system with the durability of its effects established over 12 months. In a clinical trial, 2 out of 3 patients who had either responded to treatment or completely remitted their depression symptoms reported 12 months later that they remained at the level they were at the end of the trial. Additionally, after the trial, only 1 in 3 patients needed to return for ‘maintenance’ TMS sessions. Transcranial Magnetic Stimulation (TMS) has been featured in several prominent news publications highlighting its success in treating depression. Among these publications and television shows are: Dr. Oz, The Daily Buzz, TIME Magazine, Scientific American, Discover Magazine, and Good Housekeeping. See below for more news stories discussing the latest applications of TMS Therapy. 12/26/2017 Whyy: If I lose my chronic depression, how much of myself will go with it? 07/05/2017 Charlotte Observer: On the radio, he brings life to the party. Off it, mental illness nearly killed him. 05/18/2017 Scientific American: Could TMS Therapy Help People with Alzheimer’s? For more news articles featuring TMS, please see NeuroStar’s Press Coverage page. "TMS exceeded my wildest expectations"
"It seemed too good to be true"
“Our daughter has suffered from depression for 4 years. It started with a very serious concussion her freshmen year at college while playing field hockey and manifested itself a few months later when she blacked out during a sexual assault incident on campus. For the next 4 years she struggled with deep depression while attending college and playing sports at school. After graduation, her battle got worse and we were at lost for where to turn. We stumbled across a 60 Minutes episode on Kitty Ducacas and her ETS treatment which mentioned at the very end of episode, TMS. We researched TMS and found NeuroStar. It seemed too good to be true. It was very difficult to attend her sessions since they were a 1hr and 15min drive and she works full time. However, we got through it; there were a few dips that made us worry. Now she is at end of her 6 weeks and it is pretty amazing what is happening to her. She seems happy and has signed up to run the Boston Marathon for a team fund raiser helping those with disabilities. "I am taking steps toward my dream of being a stand-up comedian"
“I’ve suffered from depression since I was 15 years old. I’ve tried many different anti-depressants and anti-anxiety medications over the years. Dr. Berger told me about TMS Therapy. I started treatment and have definitely noticed a difference. I’ve gone back and forth with being depressed and increasing medication. This just wasn’t working. I didn’t have a life, a social life. I went to work, came home, ate dinner, went straight to my room and to sleep. This pattern flowed into the weekends and spend the entire weekend in bed. I felt my life just slipping away. I had no life. I just went to work. One of the weird things is when I am at work I am myself. I was confused. When I am at I make people laugh. When I come home I’m a completely different person. My therapist explained it took so much energy for me to overcome the depression and be good at my job. I “wear a mask of a happy person” when I’m at work and I would “crash” when I got home. This is getting better as a result of TMS Therapy. I even started to push myself to do things on the weekends. A lot of people I know say they have noticed a difference. My co-workers noticed I am handling negative situations better. My closest friend even notices a difference since I started TMS Therapy. I am taking steps toward my dream of being a stand-up comedian. I am compiling a journal and started the process of applying to comedy school in NYC. I started exercising again! TMS Therapy had a positive impact on treating my depression”. – A.G.
"Things were better than I could have imagined"
"I know there is hope"
The TMS Specialist will then administer TMS Therapy over an approximately 19-40 minute period. In 30-second intervals, the device will deliver rapid “pulses” of the magnetic fields. These will feel like tapping on your scalp. Some patients may find this tapping uncomfortable. Your physician may be able to make adjustments to reduce this discomfort. Hoping to connect with patients whose stories may align with your own? TMS+YOU is an online community and national patient advocacy site for TMS Therapy. Those considering Transcranial Magnetic Stimulation can connect with patients who have had the treatment to answer questions, share insights, and get the latest information.